A new physician has begun seeing patients at the Johnson Memorial Health Cancer Care Center. Dr. Ashwin K. Vasudevamurthy, who is originally from Marion, Indiana and attended high school at Park Tudor School in Indianapolis, is the second oncology specialist at the center in Building 1159 at the JMH Hospital Campus, 125 West Jefferson Street, Franklin, IN. He joins Stephen F. Eberwine MD, Board Certified Medical Hematologist/Oncologist. Dr. Ashwin K. Vasudevamurthy graduated from Indiana University in Bloomington, Indiana with a Bachelor of Science degree in Biology, along with minors in Chemistry and Sociology. Dr. Vasudevamurthy then went on to pursue medicine at Ross University School of Medicine, graduating with his Doctor of Medicine degree in 2009. He returned to Indianapolis for residency in Internal Medicine at St. Vincent Hospital, graduating in 2012. 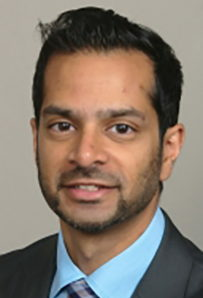 During residency, Dr. Vasudevamurthy served as the chief internal medicine resident during his PGY-III year, and served on numerous committees dedicated to the improvement of education and quality improvement, including the medical executive committee and the graduate medical education committee. Additionally, he participated in academic conferences, including poster presentations, including a case presentation at the 2009 Indiana Chapter of the American College of Physicians Meeting in Indianapolis, Indiana, and presentation of original research on Glioblastoma at the 2011 International Blood Brain Barrier Society Conference in Stevenson, Washington. After graduating from residency, Dr. Vasudevamurthy earned American Board of Internal Medicine board certification in Internal Medicine. He joined the staff of the Indiana Hemophilia and Thrombosis Center from July 2012 to May 2014, where he served as inpatient hospitalist and was able to provide care for patients with both benign and malignant hematologic disorders. While at the Indiana Hemophilia and Thrombosis Center, Dr. Vasudevamurthy's academic activities included: an educational lecture at the 2012 Indiana Academy for Family Physician's conference on the "Interpretation of Coagulation Studies"; co-authoring the content for an instructional online module focused on the management of hemophilia patients with cardiovascular comorbidity; and participating in the data collection and analysis of several ongoing studies regarding surgical outcomes for bleeding disorder patients. Dr. Vasudevamurthy completed fellowship in Hematology/Medical Oncology at Tulane University School of Medicine between July 2014 and June 2017. At Tulane, Dr. Vasudevamurthy was able to receive his fellowship training at a program which is a tertiary care referral center for comprehensive cancer care, care for patients with bleeding disorders, and a robust malignant hematology service with its own bone marrow transplant program. He served as the chief fellow of the program for the 2016-2017 academic year; his clinical responsibilities during his 3 years in fellowship included outpatient clinic, inpatient consultation services, and inpatient bone marrow transplant service at Tulane Medical Center, University Medical Center, Tulane Cancer Center, and the Southeastern Louisiana VA Medical Center. Along with teaching medical students and residents, Dr. Vasudevamurthy's other academic pursuits included more than 20 formal lectures/presentations and multiple publications, including two articles in press and a poster presentation at the 2017 ASCO Genitourinary Malignancy Meeting, as well as a quality improvement project to ensure better screening for HIV for patients with malignancy. Upon graduation from fellowship, Dr. Vasudevamurthy has earned American Board of Internal Medicine Board Certification for both Medical Oncology & Hematology, and he has recently started practicing in both Medical Oncology and Hematology with American Health Network. Patients at the JMH Cancer Care Center have access to state of the art services, care, and equipment at the hands of board-certified Medical Oncologists, Nurse Practitioners, and Oncology Certified Nurses. The multi-specialty, team-based approach coordinates the best treatment options and offers you information about ongoing clinical trials, new treatment options, and cancer-related information, education and support. JMH also offers access to a cancer registry that collects data on types and stages of cancers and treatment results, and offers lifelong patient follow-up. For more information, contact the JMH Cancer Care Center at 317.736.3346.